Welcome to my stop on the SU Stars Ebony and Ivory Blog Hop. 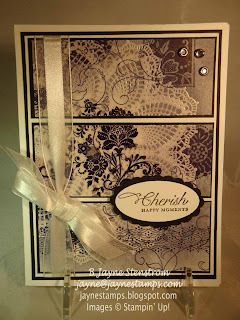 You should have arrived here from Gwyn's blog at MustLoveStampin'! I haven't seen her project yet, but I can't wait to hop around the blogs myself and see everyone's creations! I was trying to explain to my husband what a "blog hop" is. I don't think he got it. But if you're here and you've never done a blog hop, I'll give you a quick explanation. Each blog involved will have a link to the next blog in the "hop". You can just follow the links and go all the way through everyone's blog. If you ever get lost, you can always go to our "base camp" (I just decided to call it that) HERE. We could add a small pop of color if desired, but I decided to stay simple with Black and White. So let me show you my completed project. Do you like? I thought that this would be a difficult task for me because of our limitation in the color (basically none! 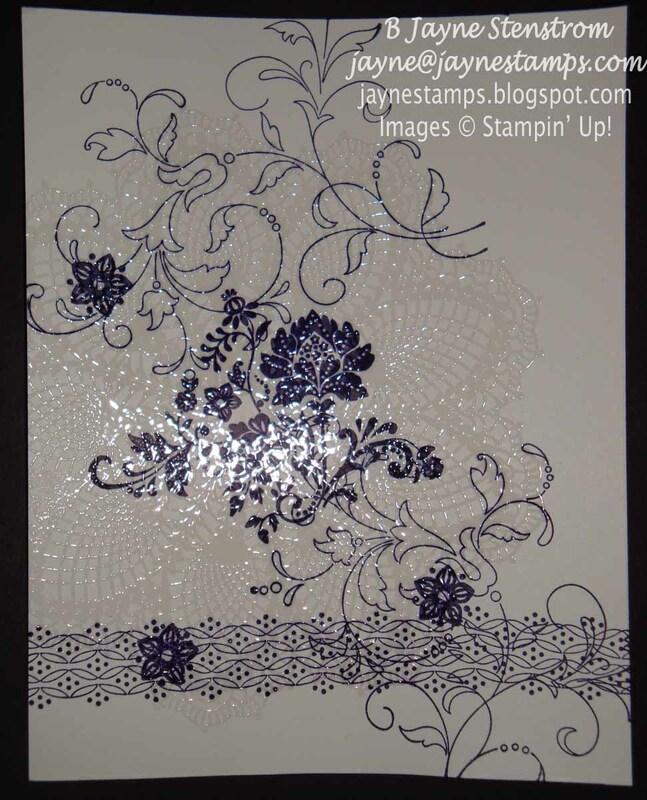 ), but I simply sat down at my stamping desk and the ideas just started to flow. 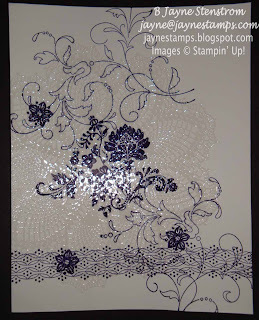 I then inked up the Hello Doily background stamp with VersaMark ink and embossed it with clear emboss powder. You can see how it looks here. Then I added some additional images stamped in black over the top and around the doily stamp. 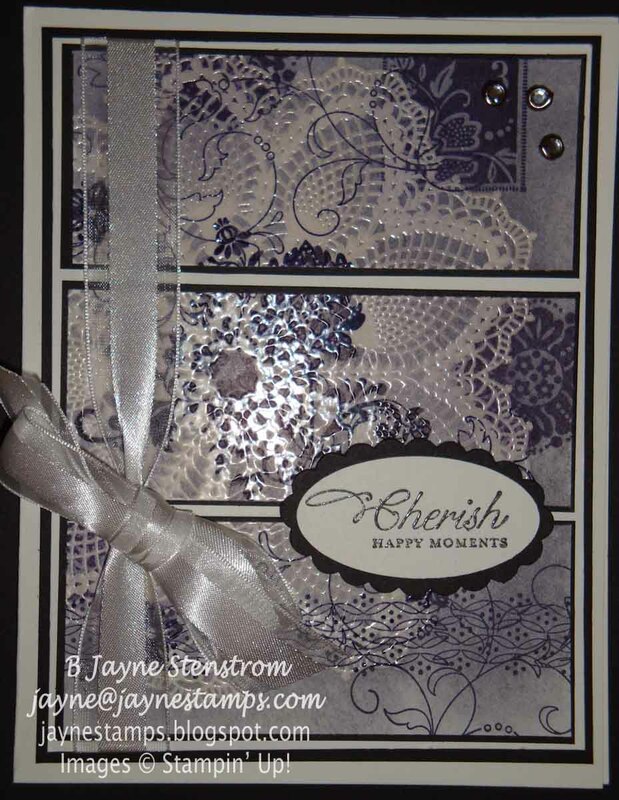 I also took a Stampin' Sponge and burnished some Going Gray ink over the entire white cardstock. 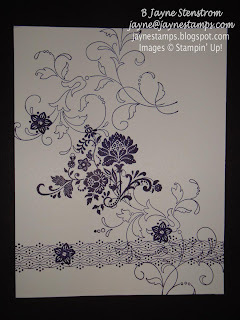 To make the doily "pop" a bit more, I took a tissue and rubbed off any ink that might have gotten onto the top of the emboss powder. 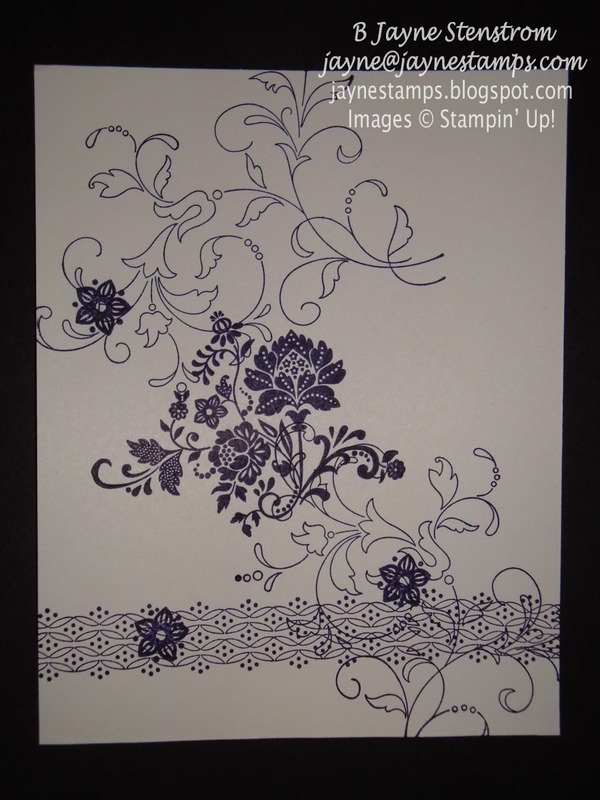 This is where the resist comes in - any ink on top of the emboss powder will rub right off. 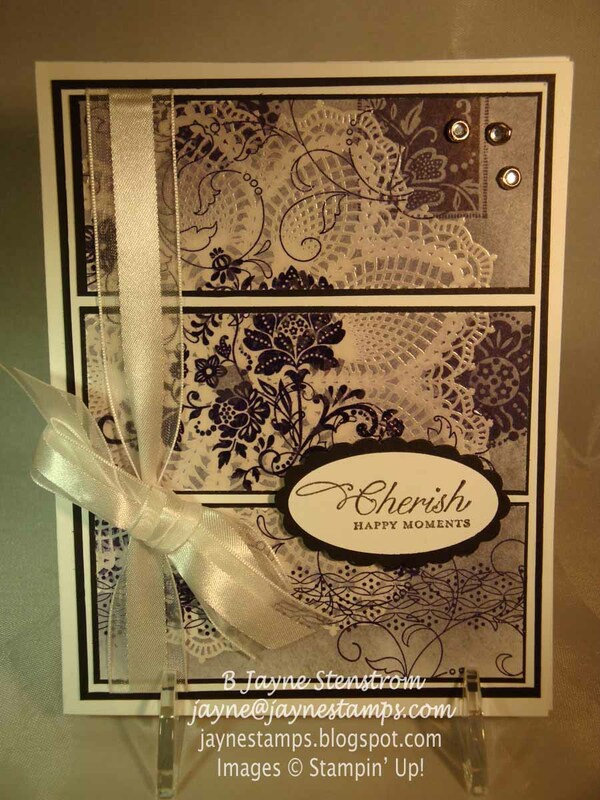 Add some layers of white and black cardstock, some 5/8" Whisper White Organza Ribbon, a few Clear Rhinestone Brads, and the saying from the You're Cherished stamp set (pg. 193 IB&C) which was stamped with Basic Black craft ink and embossed with clear emboss powder, then punched out with the Large Oval Punch and layered onto some Basic Black cardstock punched with the Scallop Oval Punch. Pop it up on some dimensions, and the card was complete! 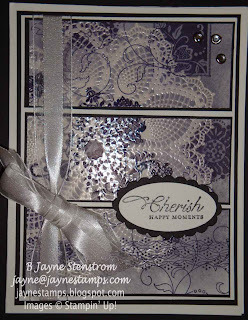 I really had a lot of fun creating this card - even though I was a little "scared" of trying it. You should try creating something with just black and white. If you do, send me a picture - I'd love to see your creations! 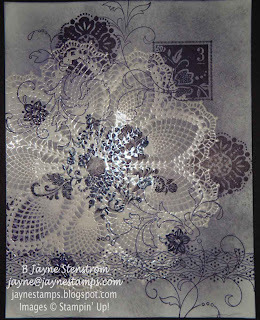 Now on to the next stop in the blog at Carol's blog at http://www.cjstamps.blogspot.com/. Hope you're enjoying the hop! Please be sure to leave us a little "love" so we know you hopped along with us! You don't have to beg me for a comment. This is just fantastic. I think you should send Roscoe some of these as blog candy. I will be happy to keep them for him. All I can say is WOW!!! Wonderful design! Jayne this is AMAZING!!!!!!!!!!! So glad you included a tutorial on it too!!! Thank You!!!!! YES I DO LOVE IT!!!!! Thank you for the tutorial. I am going to have to try that. Your card is absolutely beautiful! What a lot of work and it paid off because this card is gorgeous. Thanks for taking the challenge and sharing it with us. Wow! Very nice use of this technique! Now I need to get my stamps out and do one! Thank you for the inspiration! TFS! Nice collage! I haven't seen that in a while. Very elegant.